Kung Fu Panda 2 is good entertainment for adults and children alike. Kung Fu Panda 2 is now out in movie theaters around Australia. It has received very good reviews from critics and movie-goers. It is good entertainment for children and adults alike. In this sequel we see Po living his dream as the Dragon Warrior but he has something else on his mind as he protects the Valley of Peace with fellow kung fu masters the Furious Five: Tigress, Monkey, Mantis, Viper, and Crane. Po is told by Master Shifu that he has yet to achieve inner peace. As an adult panda Po remembers nothing of his past nor how he became the son of a goose restaurant owner. To complicate matters Po’s dream life is threatened by the emergence of a formidable villain, Lord Shen, who plans to use a secret, unstoppable weapon to conquer China and destroy kung fu. It is up to Po and The Furious Five to journey across China to face this threat and stop it. During an initial battle with Shen’s bandits, Po sees a symbol which triggers a flashback to his youth and memories he cannot fully recall. He must look to his past and uncover the secrets of his mysterious origins; only then will he be able to unlock the strength he needs to defeat Lord Shen and his army. There is much action in this colourful plot….. crashing pagodas, hurtling cannonballs, wild chases, and of course, a lot of flashy jumping, spinning, flying kung fu. And of course, a bit of comedy to balance it out. I will be seeing this movie shortly to review it. I will also look for life lessons learned in the movie, much like we did with the Karate Kid movies, 10+ Lessons Learned from the Karate Kid Movie. Young children watching Po’s adventures will be learning about good moral values as they watch him go about his heroic deeds. If anyone is keen on contributing to this, please comment below. What lessons did you learn from the movie? What are the best martial arts movies to see with your kids? A good movie will keep your children entertained as well as teach them valuable lessons about life. 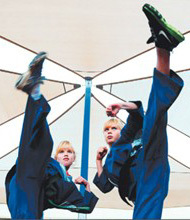 A child’s interest in martial arts may build as they try to be like the characters in the movie. Good role models in a movie can influence a child in a positive way. And hey, why should you not be entertained as well? A well-made movie should be enjoyable for people of all ages. Here are some that fit the bill. All are available on DVD. This classic spawned a generation of karate kids, and a catchy phrase: “Wax on, wax off”. Ralph Macchio plays Daniel, the new kid in town, who is targeted by bullies taught by a sensei with a bad attitude. The maintenance man in Daniel’s building, Mr. Miyagi, comes to the rescue and Daniel learns more about life than just martial arts. Recommended for: Kids aged 12 and above. Karate kid part 2 (1986) , part 3 (1989) and The Next Karate Kid (1994) followed the original, but were considered just average by critics and movie fans alike. 12-year-old Dre Parker was a happy kid in Detroit, but his mother’s career move landed him in China. Dre falls for his classmate Mei Ying, but cultural differences make such a friendship very difficult. The class bully, Cheng, becomes jealous and trouble starts. Cheng starts a fight with Dre and puts him down easily. The bullying continues as Cheng and his gang of Kung Fu-trained friends target Dre. With no friends of his own to turn to, Dre luckily gains the help of his building’s maintenance man, Mr. Han, who is secretly a master of kung fu. Han teaches Dre that kung fu is not about punching and kicking, but maturity and peace. With Han’s help Dre learns to face his fears (the bullies). This movie was considered much better than the other Karate Kid movies, with the exception of the original. I have written three articles about this movie How to Watch the Karate Kid 2010 Movie with Your Kids, 10+ Lessons Learned from the Karate Kid Movie, and Ten More Lessons Learned from the Karate Kid Movie. As you can see from my articles, there are many lessons for kids to learn from this movie. The first in a series and by far the best. In this, four turtles and a rat are transformed into giant, human-like characters when they come in contact a mysterious gel, Ooze, in a sewer. The wise rat becomes their mentor, and teaches them to become lethal Ninja fighters. The turtles use their martial arts skills to combat the crime in New York City. But when their mentor is captured by an enemy from the past, can they hold true to what they’ve learned, and stay together as a brotherhood? Filled with brawls, one liners, and goofiness, this film recaptures the original comic on which this is based, to perfection. The film is very entertaining for kids, bringing a cartoon into real life. The follow-ups to this movie were not considered very good. There is some swearing in this movie and some bloody fights. For this reason it is recommended for kids aged 12 and up. Po the Panda is the fattest, laziest, clumsiest animal in all of the Valley of Peace, but becomes an unlikely hero when it is discovered he alone has the power to stop his tribe from certain destruction at the hands of the snow leopard, Tai Lung. His dreams of becoming a master of the martial arts are realised when the Furious Five legends Tigress, Crane, Mantis, Viper, Monkey, and their sensei, Master Shifu, reluctantly draw on their vast knowledge of fighting skills to build him into a lethal fighting machine. Will he fulfil his destiny as a hero who will save his people during their darkest hour? This movie was rated very highly due to its mix of humour, great martial arts action, and colourful animation. Adults also found it very entertaining. Recommended for: Kids 6 years and above. It this story, a popular American teenager named Wendy Wu discovers that in order to win the coveted crown of homecoming queen, she must first learn the way of the warrior. When a mysterious Chinese monk named Shen arrives to mold Wendy into a fearless kung fu warrior, however, her royal aspirations suddenly take a back seat as she struggles to juggle her boyfriend, her homework, and the fierce competition to become homecoming queen. As Wendy trains her mind, body, and spirit in the martial arts, her inner warrior begins to emerge, and the girl who once obsessed over popularity gradually realises what really matters in life. This movie had mixed reviews but I like it because it teaches valuable lessons, and is an inspiration for little girls in the martial arts. Recommended for: Kids 8 years and above. A soccer player, whose career was abruptly ended when he was unfairly injured by his nemesis during a match, meets a Shaolin kung fu student trying to spread the word of kung fu. The ex-soccer player helps reconcile with his five brothers, and teaches them soccer, adding Shaolin kung fu as a twist. They then attempt to win $1 million at a soccer tournament, ultimately facing the dreaded Team Evil in a battle for the the title. Although the plot is utterly ridiculous, this movie was very popular among moviegoers and critics. Its goofy fun, heaps of action, top special effects, and the appeal of the underdog were reasons for its popularity. Set against the breathtaking landscapes of China during the Ching Dynasty, this story involves two women, both amazing martial artists, whose fates bring them together in an astonishing showdown. A magical sword given by a warrior (Chow) to his lover (Yeoh) is stolen and the quest to find it ensues. Rated very highly by critics and the public, the story is compelling, the scenery is gorgeous, and the direction is fantastic. The acting is brilliant and the fight choreography is top-notch. Recommended for: Kids 12 years and above. Do you know of any good martial arts movies for kids? Last weeks post 10 Lessons Learned from the Karate Kid Movie got the ball rolling. We came up with ten more life lessons learned from watching this movie. Thanks to all who contributed. Lesson #11—Focus on the task at hand. By constant drilling and practising, you are gaining “muscle memory”, so even the simple things like putting a jacket on and taking it off in a certain way will become second nature, becoming life skills we can use without even thinking. Contributed by Tayla Meath. Lesson #12—Never judge a book by its cover. The old mild-mannered maintenance man is not what he appears to be; a kung fu expert. Mr. Han was clearly capable of doing more than just “fixing a tap”. How would you ever know? Contributed by Wendy Leeming. Lesson #13—Balance is important in life. You cannot always just work, work, work. Dre pulled Mei Ying away from her music practice for a few hours, which re-charged her spirit and helped her relax during her stressful audition. You need rest and social time to balance out your hard work. Contributed by Sinem Kileci. Lesson #14—What you name a movie contributes to its success. Although this movie was about kung fu, not karate, the name Karate Kid taps into the success of the earlier movie. The older generation, now parents of children who will see the movie, are very familiar with it. Contributed by Grant Hogan. Lesson #15—Everyday movements can contribute to what we learn in class. Putting on the jacket, avoiding something thrown at you, or waxing a car (first Karate Kid Movie) can make martial arts movements second nature. Contributed by Nathan McCarney. Lesson #16—Honour your word. If you say you are going to do something, do it. Dre promised to attend Mei Ying’s audition. Despite great hardship, he got there. He was true to his word. Lesson #17—The only person you need to control is yourself. The wise Mr. Han counseled Dre on this. Dre could not control what the bullies or Mei Ying’s parents did or thought, but he could control what he did. A wise person does not worry about what is out of his or her control. Lesson #18—The teacher can learn from the student. Mr. Han learned a lot about living life from Dre. He put some of his sadness about the past aside and put his energy into the building of Dre’s spirit. Lesson #19—The martial arts can teach you respect and manners. Mr. Han did not like how Dre showed a lack of respect for his mother. By forcing Dre to do the jacket drill, he was also teaching him to have better manners and respect for his mom, and the importance of doing the right thing. Lesson #20—The martial arts can build your confidence. Dre’s mother was amazed by the difference in his confidence at the end of the movie. The martial arts is about getting out of your comfort zone, which builds your self esteem and self confidence. I saw the Karate Kid Movie a few days ago. Really enjoyed it. As a kids karate sensei, I decided to look for positive things in the movie. Since there are so many lessons to be learned about life in this movie, I listed them. The list is called 10+ for a reason. I am giving you, my readers, a head start. I would like to make this list 20 Lessons Learned from the Karate Kid Movie. I put this challenge out to all of you. Pick your brains and contribute some more lessons and together we will build the world’s most awesome list of lessons learned from this movie–our list. Lesson #1–Adapt to the circumstances. Dre and his mother moved to another land far away and with a different language. Although very difficult to adapt under these circumstances, Dre found a way. He started making friends and learning the language. Lesson #2–Sometimes you have to fight to keep a friendship alive. Dre and Mei Ying had many challenges in their friendship. Their friendship was opposed by Mei Ying’s parents and by Cheng, the bully, and his crowd. Nevertheless they valued each others friendship enough to perservere. Lesson #3–Everyone has their moments of weakness. Mr. Han was idolized by Dre. Even so, Mr. Han had his own demons. Mr Han’s weakness was exposed in the car scene. The victim of a tragedy involving his family, he was unable to overcome the grief. Lesson #4–Grief and sadness can be overcome by throwing yourself into your training. Dre was wise enough to know what would drag Mr. Han out of his grief–focus on training. Lesson #5–When blocking, be powerful and strong. Your first move in a self defence situation, usually a block, has to be strong to be effective. Mr. Han illustrated this with Dre. Lesson #6–Life will knock us down, but we can choose to get back up. There will always be setbacks in life, but how we react to them is the true test of our character. Dre chose to rise to the challenge. Lesson #7–A warrior’s spirit is not forged in one day. The hours upon hours Dre spent with Mr. Han, the relentless jacket drill, and the other brutal training methods are what forged Dre’s spirit. Lesson #8–By confronting our fears we overcome the fear itself and gain respect from others. By facing Cheng and the others in the ring, Dre overcame his fear of them and earned the respect of Master Li’s kung fu school. Lesson #9–Trust in your teacher. The sensei has many more years of training than you. You must follow his or her advice without question if you are to progress in the martial arts. Dre did not see the wisdom of the jacket drill at first, but he persisted because he trusted Mr. Han. Finally at the end of his rope, Dre understood the value of the drill when Mr. Han showed him how it worked in a real self defence situation. Lesson #10–There are no bad students, only bad teachers. So true, as Master Li was affecting every student in his organization with his poisonous attitude. Every one of his students was once a white belt and had the potential to be a good person, if only guided by the right teacher. Ok everyone, there’s the first ten. Bring it on! Is this Movie too Violent for Young Children ? There has been a fair bit of controversy surrounding the Karate Kid Movie 2010. Despite the debate as to whether this film is suitable for children to view, many youngsters will see it. You have to decide for yourself whether your child is mature enough to deal with the violence in it. As a kids karate sensei, I would like to make suggestions on how to view this movie, and how to discuss it with your child. First off, violence sells in Hollywood. MMA is so popular because people want to see real fighting action, maybe even someone getting hurt. Sometimes more violence than necessary is shown to make a movie dramatic and sell tickets. The consequences of such violence are not shown either. Missing teeth, broken bones and other serious injuries are not portrayed accurately by Hollywood because it is too gory. The pain and trauma is also not shown because it is too confronting to viewers. Realize that fighting is not the way to solve our problems. There are many better ways of resolving conflict other than violence, and the first is communication—talking it over. Could the differences between the characters in this movie have been resolved in a better way? The bullies in this movie, like the original Karate Kid Movie, trained in dojos that taught glorification of violence. This is extremely rare in the martial arts world, but it makes the movie more dramatic, because there has to be a bad guy in this story to make it interesting. The vast majority of martial arts instructors teach respect and avoidance of violence. The tournament in this movie, just like the first, is not even close to what an actual martial arts tournament is like. Realise there are rules in tournaments and they are designed to prevent injury. There is also mandatory protective equipment worn in tournaments. If tournaments were run like this no one would ever attend them. Look for good in this movie. Try to find lessons to be learned about life in the story. Try to put yourself in the different actors’ positions in this movie and see where they are coming from. Is there peer pressure amongst the bullies? Was the bully brainwashed by his instructor? Was he racist? Who taught him to be racist? Try to see how another culture lives from day to day. Remember, different is not always better or worse—it is just different, and that differences in language, food, and customs is what makes life interesting. How interesting would the world be if we were all the same? Look for common threads as well, as there are many western influences in China today. Is the western way of life always the best? Look for the beauty in the scenic sense, and also in the people and how they live. Remember, the martial arts originated in this part of the world. What lessons did you learn from this movie? I am very interested to hear from you. If you reveal too much about the outcome, I might have to edit your comment, so we don’t ruin the movie for other people who may want to see it. Please keep this in mind. Note: Since I wrote this post Sue over at My Journey to Black Belt has reviewed the movie in a different light. Although I disagree with her on many aspects of the movie, we agree on others. It is well worth your reading, for a well-balanced view. While there, check out her blog–it is an excellent martial arts site. Who would win between a karate kid and a kung fu kid? With the release of the latest Karate Kid movie, which should have been named the “Kung Fu Kid”, every child is asking this question. As a Kenpo karate instructor, I might be expected to be biased. But the first point I want to make is, it does not matter which you study. What is most important is that you find a great martial arts instructor who can motivate you to be your best. There are only so many ways you can strike with your hands or feet (or elbows and knees for that matter). Many of the tools are the same, they just call them different things. Take the kicks for example. In Kenpo they call it a wheel kick, in kung fu a roundhouse kick. They are the same kick. The front snap kick is almost identical between karate and kung fu. This is not surprising since karate was derived from kung fu in China and from Te on the island of Okinawa centuries ago. In general, the karate kid utilises a straight ahead linear power attack, with the idea of a one-strike knockout. The karate kid will usually stand in a deeper stance. The kung fu kid moves in a circular motion using parries to redirect attacks, in a more upright boxer-like stance. But keep in mind there are dozens of different styles within both karate and kung fu that vary widely in stances and techniques. With a skilled practitioner, kung fu and karate are equally effective. In over 20 years of competing and coaching open tournaments, I have seen many champions of both martial arts. There has been no clear victor in this battle. Kenpo karate, the style we teach, is unique in that it is a mixture of the hard powerful linear movements of karate and the soft, graceful, flowing, circular movements of kung fu. Which One for You ? Don’t get caught up in the hype surrounding this movie. If you are sincere about becoming a karate kid or kung fu kid, pay a visit to the local martial arts studio, whatever type it may be, and make a judgement for yourself which style is the best for you. In conclusion, there is no winner—they both are equally effective if the practitioner is a highly-skilled martial artist.